The name makes it sound like a giant oil field—the National Petroleum Reserve-Alaska—but the largest unit of public land in the country, about the size of Indiana, has nourished migratory birds, caribou, polar bears, walruses, belugas, and people for centuries. Click to see wildlife migration routes and nesting areas. Courtesy Audubon Alaska. Yet, ongoing pressure to expand oil and gas exploration and production threatens this region. Fossil fuel companies want to open areas now closed to leasing, and oil and gas developments already push into places vital to the health of wildlife and the communities that depend on these resources for their way of life. 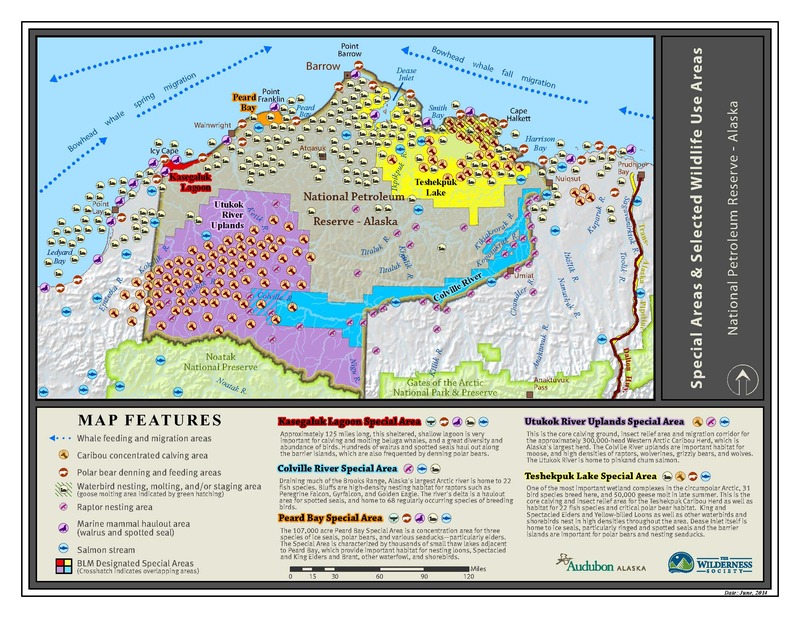 The laws governing management of the 22-million-acre reserve, also called the Western Arctic, specifically require “protection of the environ­mental, fish and wildlife, and historical or scenic values.” Some areas are closed to oil and gas activities because of these values. Due to the subsistence and ecological importance of this Arctic region, the reserve has five designated “Special Areas,” including those around Teshekpuk Lake and the Colville River. These areas are at risk. The Teshekpuk Lake area provides the primary calving grounds for the Teshekpuk Lake Caribou Herd, a key subsistence resource for Alaska Native people living north of the Brooks Range or North Slope. 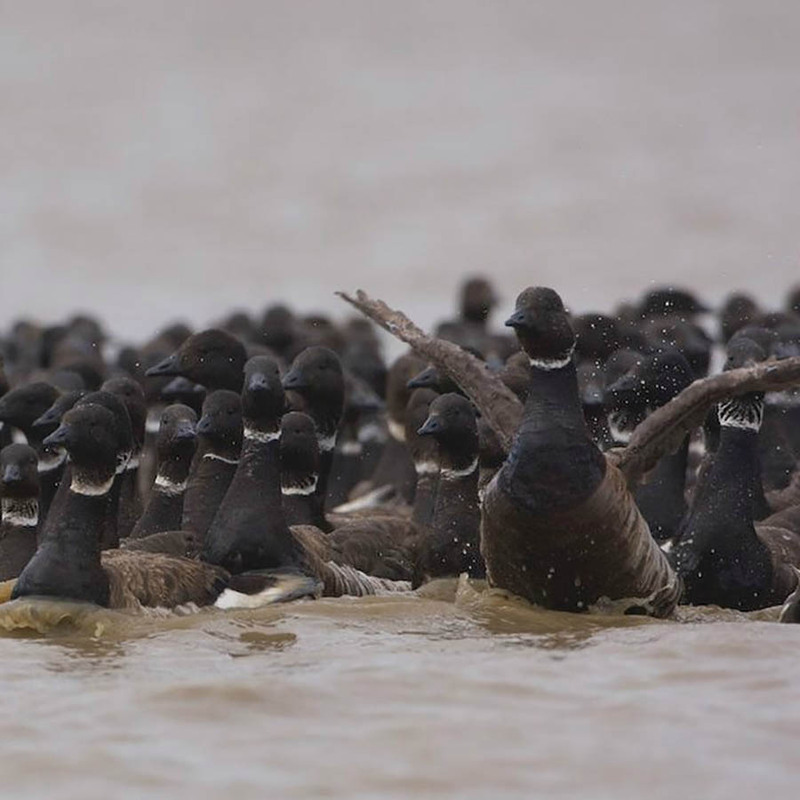 The lake area, along with the neighboring Smith Bay marine habitat, also supports the highest density of shorebirds in the circumpolar Arctic, including threatened spectacled eiders, Steller’s eiders, yellow-billed loons, dunlins and American golden-plovers. As many as 35,000 greater white-fronted geese and 37,000 brant molt in the area as well, plus thousands of Canada geese and snow geese. The Western Arctic has other vital areas, too, including the largest thriving delta in northern Alaska, the Colville River Delta. It provides critical nesting sites and adjacent hunting areas for peregrine falcons, gyrfalcons, golden eagles, and rough-legged hawks. Today, the community of Nuiqsut, which depends heavily on healthy subsistence resources in these areas, finds itself increasingly surrounded by oil and gas development. The Alpine Development by ConocoPhillips and the Smith Bay Development by Caelus already encroach on the Teshekpuk Lake and the Colville River special areas. The range of oil and gas activities in and around the reserve poses a significant threat to the land, water, wildlife, and communities that depend on a healthy Western Arctic. The region provides a home and subsistence foods to Alaska Native people. It holds wilderness that supports thriving waterways, migration routes, wildlife, and communities. Trustees and our partners will remain vigilant in protecting the special areas and values of the reserve now and into the future.